Piracy: Who Wins, Who Loses? In the MPAA propoganda video, the party line is given by David Goldstein: "the piracy issue I don't believe will effect the producers, I mean it does effect them but it is miniscule to the way it effects the guy working on construction, the lighting guy, the sound guy." Milena Davidson-Levine has brought to our attention that Southpark has a somewhat different perspective. Neither the MPAA nor Southpark gives a rationale for their point of view. Economics does enable us to determine who wins and who loses from piracy. The crucial concept from economics is that of opportunity cost and economic rent. Your opportunity cost is what you could earn in your second best choice of job (presuming you are already making use of your best opportunity). Your economic rent is the difference between what you earn and what your opportunity cost is - it is a measure of how much you benefit from having your current job. Economic rent is positive for most people - they are better off doing what they are doing than quiting and doing something else. But for the ordinary worker, economic rent is quite small, because the ordinary worker faces a lot of competition from workers just like him, and there are many similar jobs available. A good example is the mailworker in a different MPAA propoganda video: if the Matthew were to lose his job working for the studio delivering the mail to Clint Eastwood, he would have little difficulty finding work in another one of the many mailrooms around. Perhaps he would not like this as much as delivering Clint Eastwood's mail, but then again, since he wouldn't get to see Clint Eastwood, perhaps he would make a few more dollars. Either way, working in a different mailroom in a different industry (his opportunity cost) wouldn't find him much worse off. Similarly the construction worker in the movie industry has a job not much different from and paying about the same as a construction job in another industry, so would not be more than inconvenienced by being forced to switch industries. So too the many other ordinary occupation held by ordinary people in the movie industry, such as the security guard and fireman in the complete MPAA video. Basically, the more ordinary the occupation, the less the economic rent. By way of contrast, the big stars - the "million dollar employees" - earn very large economic rents. For example Lars Ulrich, the drummer for Metallica, was a service station attendant before becoming a rich rock star; Harrison Ford was a cabinet maker. The difference in salary between being a big star and a service station attendant or cabinet maker - the economic rent received by these two - is huge. The economic consequence of the monopoly power granted through copyright is that it drives up the economic rent of scarce resources. That is, copyright raises the economic rent of big stars - who are scarce - while having little impact on the salaries of ordinary workers - who have many competitors and are not scarce. So reversing the field, we can see the impact of weakening copyright - due to piracy for example. The big losers are those who command the big rents - the big stars. So Southpark has it about right. The MPAA has it exactly wrong. Although one cannot blame them for running their own progaganda film instead of the Southpark clip. However true the Southpark clip might be, it would be tough to sell Congress on ever more restrictive laws based on the fact that without them a few big stars might be a little less rich. 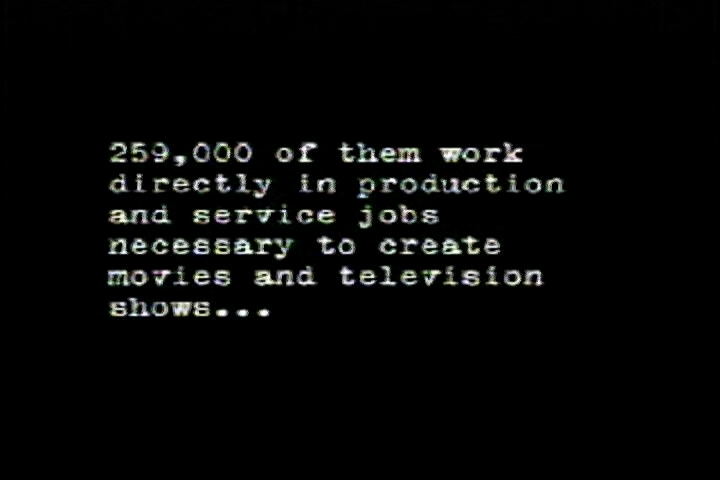 The complete MPAA propoganda video is remarkably also for the extent to which it exagerates the importance of the movie industry: we wouldn't really want to lose all these ordinary jobs would we? In the first and second screen of the video it is claimed that the U.S. motion picture industry employs 580,000 people nationwide, 259,00 of whom work directly in the production and service jobs necessary to create motion picture and television shows; the final screen lets us know that the "U.S. Copyright Industries" contribute more to the economy and employ more American workers than any other single manufacturing industry. In this case, it is the U.S. Census Bureau that has a somewhat different perspective. The "U.S. Copyright Industries" are what the Census classifies as part of the "Information" industry. According to the 1997 Economic Census, the "Motion picture & sound recording industries" which includes not only motion picture and television production - but also music and sound recording - employs 275,981 paid employees. By way of contrast, IBM alone employs over 300,000 people. The MPAA may perhaps be including radio and television broadcasting as part of the "U.S. motion picture industry" - but of course the jobs of those doing broadcasting does not much depend on whether or not they are broadcasting copyright or non-copyright material. The remaining "Copyright Industries" are the publishing industries, which are quite a bit larger with 1,006,214 paid employees - but many of these (403,355) are in newspaper publishing - which receives practically no protection from copyright. Accepting the MPAA's exagerated estimate of the motion picture industry, and adding in the entire publishing industry, we get 1,586,214 employees. Looking at manufacturing we find three industries: fabricated metal product manufacturing, computer and electronic product manufacturing, and transportation equipment manufacturing all employ more workers. Looking more realistically at the industries that benefit from copyright, we add the 275,981 workers in motion picture and sound recording to the 336,479 publishing workers that do not work for newspapers or publish software to get an estimate of 612,460 workers - a tiny fraction of the U.S. workforce, and about the same number of workers employed, for example, in the furniture industry. We may ask whether the benefit to these workers of imposing restrictions on electronic devices to reduce (by some trivial amount) piracy justifies the cost to the 1,698,529 workers who produce them - not to speak of the cost to the 250 odd million people who use them. But this comparison is not fair, because it assumes that the substantial reduction of copyright - a policy that the two of us, among many others, advocate - would necessarily imply the disappearance of all those 612,460 jobs! This is obviously not the case. In fact, it may even lead to an increase in the number of jobs even if it would most certainly reduce the income of the very selected few (maybe 1 or 2% of the total number of employees in the copyright industries) who appropriate all the big monopoly rents created by the existence of copyright. For the remaining 98% of the people working in the copyright industries, it would be business as usual.